Lately, I’ve had the opportunity to experience theatre that is not full of flashy sets or intricate costumes, but of minimal design and I’ve grown to appreciate this style immensely. 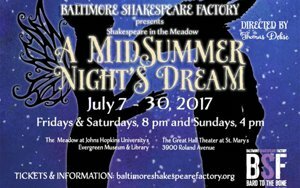 I’m learning that you don’t need all the bells and whistles to tell a good story (notice, I said “good” story) and Baltimore Shakespeare Factory (BSF) demonstrates this near perfectly with their latest offering, A Midsummer Night’s Dream by William Shakespeare, Directed by Tom Delise. It’s good old fashioned story-telling in a serene, outdoor setting that takes you back to the days of old when Shakespeare ruled the stage and people appreciated a good story. If you get a chance to check out a production in the Meadow at Johns Hopkins University’s Evergreen Museum and Library… DO IT! In the middle of a bustling city, this small patch of land is the perfect setting for an evening of Shakespeare, and you can bring your own picnic if you wish! The sounds of nature surround you as you watch a timeless story unfold before you performed by able actors working from a flawless text. In a nutshell (if it’s possible), A Midsummer Night’s Dream is about events unfolding around the marriage of Duke Theseus and Hippolyta, the former Queen of the Amazons. 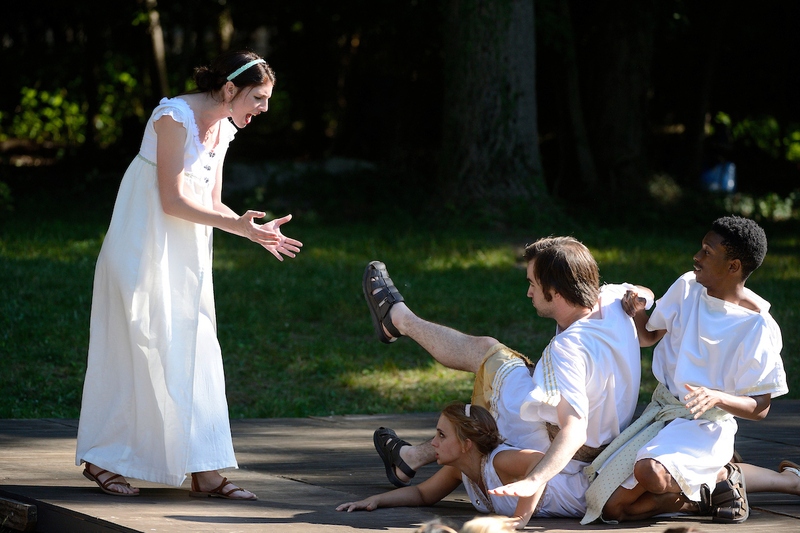 Included in these events are the escapades of four young Athenian lovers, a traveling troupe of actors – The Mechanicals, a bunch of fairies, and the King and Queen of the Fairies who are throwing monkey wrenches in everything while trying to fix it at the same time. Sounds complicated doesn’t it? Well, it’s not too complicated if you pay attention and it’s quite funny and farcical making for a great evening of theatre. Director Tom Delise, a Shakespeare purist, seems to have a confident grasp on the material. His vision of bringing pure Shakespearean theatre to the stage with little gems of modern day references to tell the story make it easy to follow and indubitably entertaining. He keeps the action moving and interesting creating a smooth flow that isn’t overwhelming to those not as experienced. He manages to keep it down to a nice 2-hours while still telling the entire story which is a feat in itself when it comes to any Shakespeare play. Kudos to Delise for an impeccable production. Costume Design by Jessica Behar is simple, yet very appropriate and effective. Being a fanciful piece with a fairy king and queen and man turning into a donkey, one would think the costumes have to be outlandish and complex, but Behar has managed to design a costume plot that isn’t over the top, but still quite effective. Of course, the togas and tunics are present, but ornamented nicely and subtly differentiating the classes (the upper crust and the actors, really). 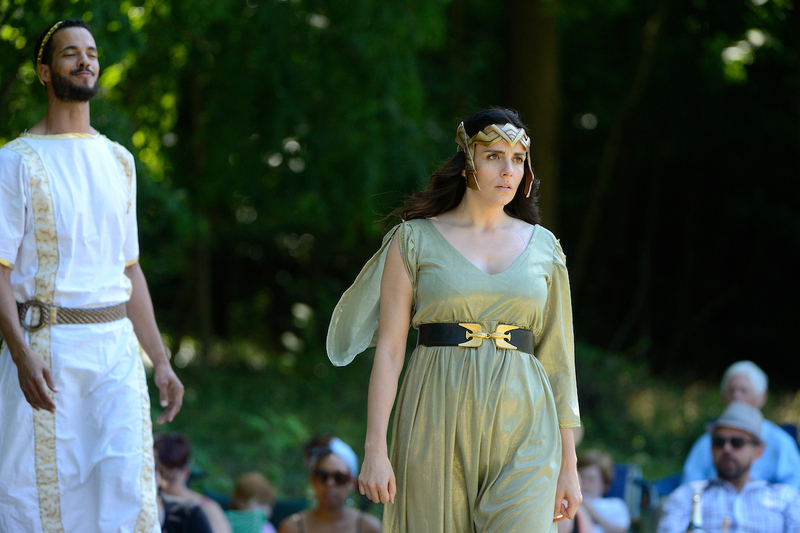 Tatiana, Queen of the Fairies is elegant in her flowing robe while Oberon, King of the Fairies is aptly costumed in a nature-inspired ensemble with funky headpiece included. Overall, Behar’s design is appropriate, creative, and adds value to the production as a whole. Moving to the performance aspect of this piece, it’s worth saying the entire ensemble gives 100% to their performance and work quite well together. It’s a joy to watch this cast as a whole and they know their stuff! Taking on the roles of the four confused lovers are Fred Fletcher-Jackson as Lysander, Liz Galuardi as Hermia, Davon Harris as Demetrius, and Micaela Mannix as Helena and this quartet hits the nail on the head with their performances. Their chemistry is second to none and they’re comedic timing is delightful. In a particularly farcical scene where poor Hermia is actually sat on by the boys, I was laughing out-loud and thoroughly enjoying the physical comedy before me. All four give confident performances and are a joy to watch. The Mechanicals, the acting troupe, compsed of Cheryl Campo, Tess Garret, Jeff Miller, Tegan Williams, Kathryne Daniels, and Shaquille Stewart, much like their name implies, is a well-oiled machine and all work well off of each other. Their mini play-within-the-play had me belly-laughing – especially Jeff Miller, who had the honor of taking on the female role, as many males did in the time period, and he played it to the hilt with an impeccable grasp of the cheeky comedy. Other highlights in this troupe are Shaquille Stewart who takes on the role of Nick Bottom, the egotistical, self-admiring actor, and Kathryne Daniels as Peter Quince, the flustered writer of the troupe. Stewart steals just about every scene he’s in with his physical comedy and superb delivery and Daniels humorously portrays Quince’s frustration with big gestures and asides that work well with the material. It’s a job well done by all. 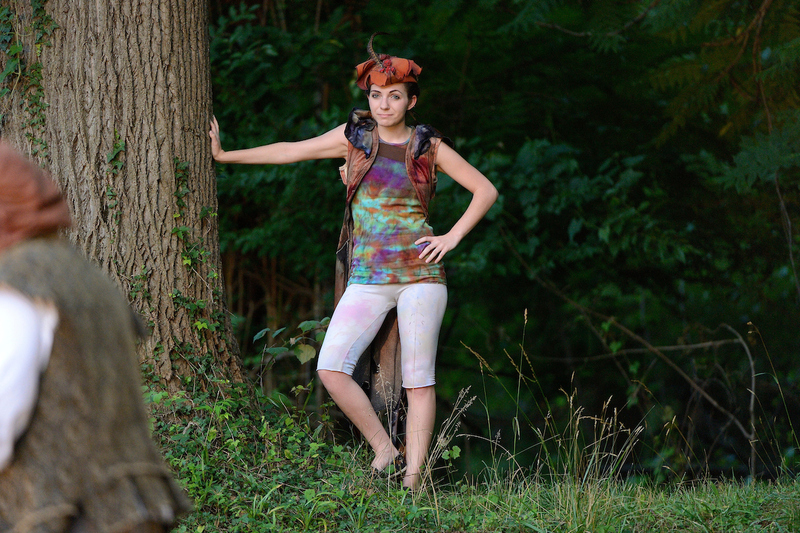 Allie Press tackles the role of Puck, the impish go-to guy for King Oberon and she really grasps this character. The character of Puck means well and is only doing his masters bidding but he is also a lurking observer most of the time and strikes when it is most opportune. Press skillfully delivers her dialogue and moves about the stage effortlessly giving a confident, strong performance. Definite highlights of this production are the Titania and Oberon, the Fairy Queen and King played masterfully by Valerie Dowdle (a BSF Company Member) and Elijah Moreland. Their chemistry is brilliant and they work very well off of each other. 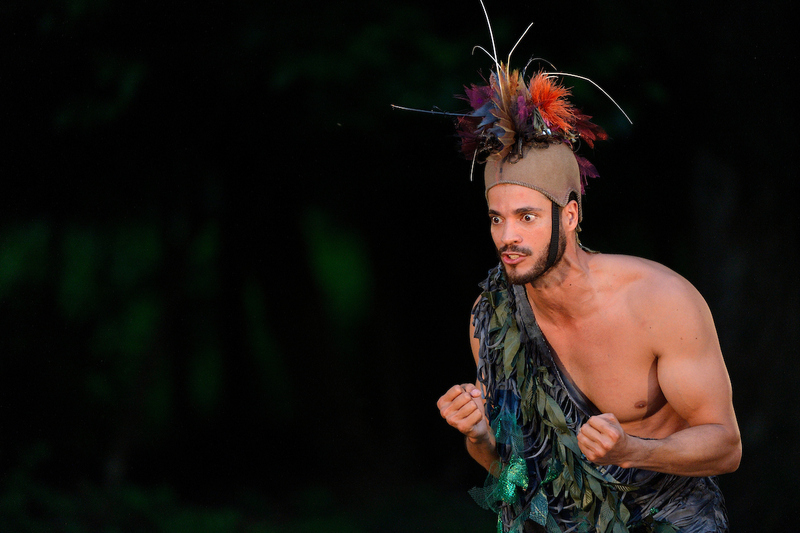 Moreland, in probably the flashiest costume in the production, moves confidently and gracefully taking on not only the intricate role of Oberon, but also of Duke Theseus. He delivers his dialogue clearly and has a good comprehension of his characters. His interaction with the audience is subtle and not in your face which is something I can totally deal with not being a huge fan of breaking the fourth wall. Overall, Moreland has a strong presence on the stage and gives an absolutely commendable performance. Valerie Dowdle also takes on two roles – that of the Titania and Hippolyta and she nails both of these characters. Quite an able Shakespearean actor, Dowdle effortlessly embodies her characters, especially that of Titania, and gives a strong, graceful, and authentic performance. Her comprehension of the material is apparent and her delivery is completely natural, making it easy to follow and understand. Another fine performance from Ms. Dowdle. 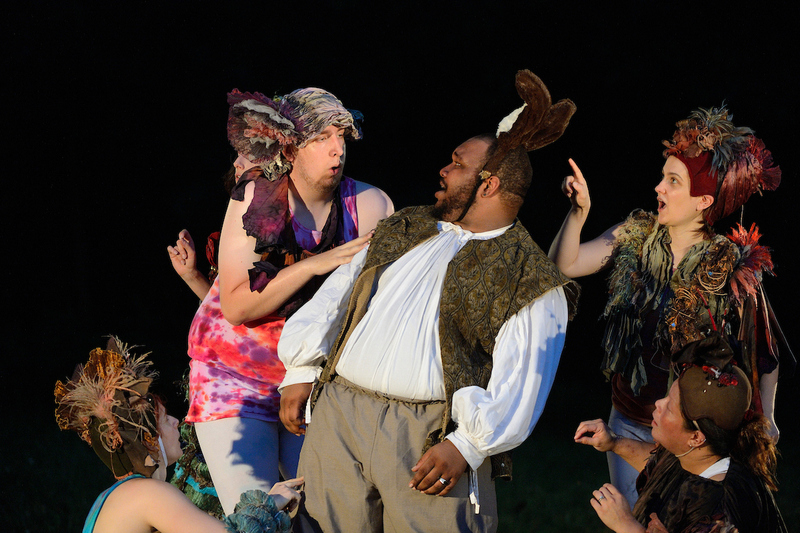 Final thought…A Midsummer Night’s Dream at Baltimore Shakespeare Factory is a step back in time where there was no need for big spectacles or lights and sound but the actors told the story and the text spoke for itself. 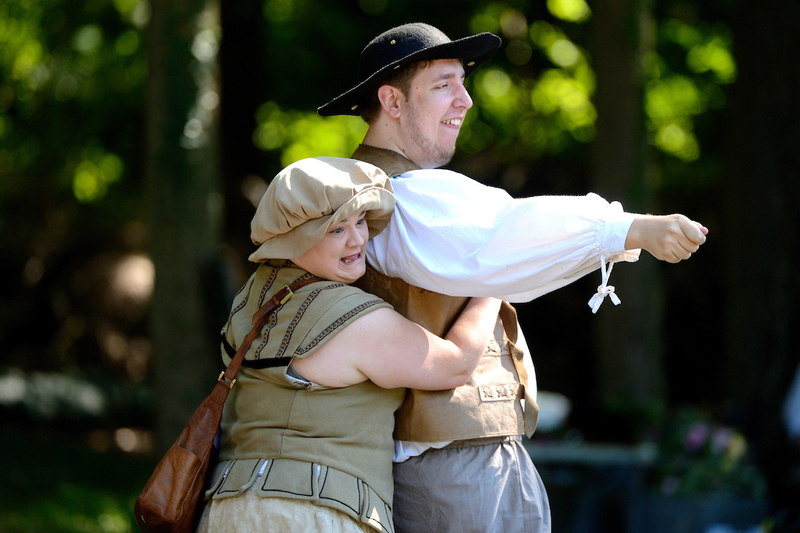 Baltimore Shakespeare Factory’s attempt at producing authentic Shakespearean theatre is a success, especially out on the rolling meadow at Johns Hopkins University’s Evergreen Museum and Library. T he actors are well-rehearsed and have an impeccable comprehension of the story they’ve been tasked to tell and their interpretation, along with the vision of Director Tom Delise, is easy to follow and quite entertaining. This is a fun, humorous, timeless tale and BSF knocks it out of the ballpark with this production. Those experienced with Shakespeare or those who are currently discovering his work will be thoroughly delighted and entertained. 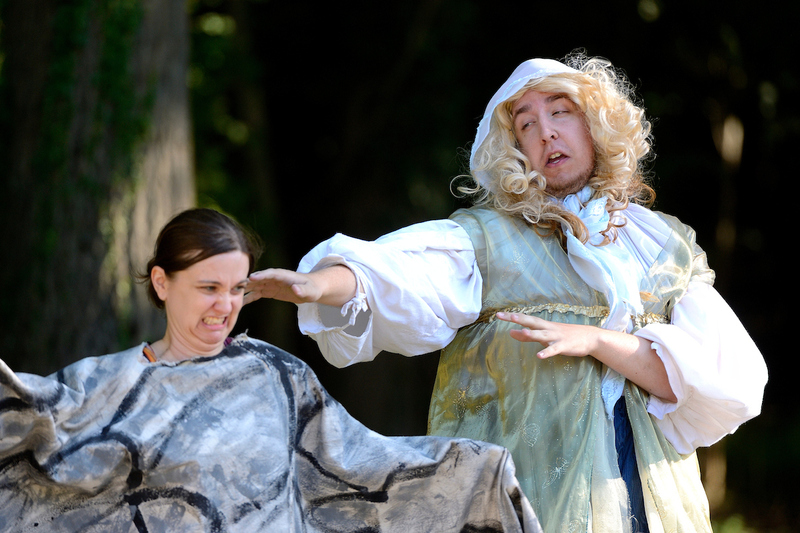 This is what I thought of Baltimore Shakespeare Factory’s production of A Midsummer Night’s Dream… What did you think? Please feel free to leave a comment! 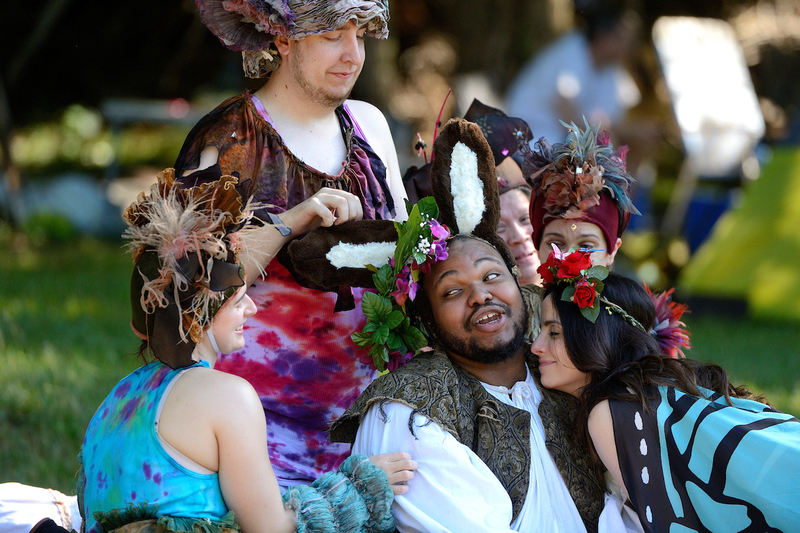 A Midsummer Night’s Dream will play through July 30 at Baltimore Shakespeare Factory, The Meadow at Johns Hopkins University’s Evergreen Museum and Library. For tickets, purchase them at the door or purchase them online.